It can't actually be Play-Doh, so before I get into legal trouble, let me be clear that I'm using it the most generic of senses....."modeling dough" is more accurate and legal-friendly, I suppose. You can find the quick and easy tutorial on ecochildsplay. 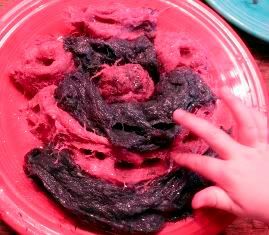 Summer is here and kids are home from school, so start saving your dryer lint for a rainy day. They'll love it!